They’re kind of like an octopus and kind of like a squid; they aren’t fish, and they’re not cuddly. But cuttlefish are some of the coolest critters you’ll ever find in the ocean. The first time I met a cuttlefish face-to-face, I was snorkeling on the Great Barrier Reef in Australia. While I was busy looking around at everything, there were two giant cuttlefish busy looking at me! And I mean really LOOKING – I could see their eyes moving, looking over my body, watching the bubbles I was making; I could almost sense their amusement over this ungraceful creature flailing around in their backyard. They watched me for several minutes, all the while changing their colors and textures as they moved over the reef and sandy ocean floor; beautiful, graceful, mesmerizing. When they finally got bored of me, I was sad to see them go – I understand that we humans are far less interesting to them, but I could have watched them for hours! 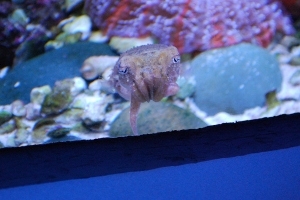 The cuttlefish we visited at the California Academy of Sciences are “dwarf cuttlefish”. They grow to a mere 3-4 inches long, and only live for about a year. There are no cuttlefish species local to the US, and so far only the dwarf species has been successfully bred and displayed in captivity (and only within the past 10 years). But other than their size and lifespan, dwarf cuttlefish share the same qualities as all cuttlefish, including their keen eyesight, impressive intelligence, amazing hunting techniques, and stunning camouflage abilities. So much to see in such a tiny little package! Next time you visit the Cal Academy, be sure to go downstairs to meet these super-cool little critters. Take a good, long look at them – the might be looking back at you!